A family business, KRUPS was founded in 1846 by Robert KRUPS as a 'brand dedicated to precision and technical perfection'. With the launch of the first electric coffee grinders in 1956, KRUPS revolutionised the quality of home-ground coffee. 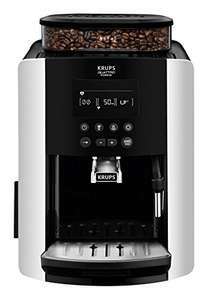 Backed by 150 years' experience, today KRUPS is acclaimed throughout the world for high-quality coffee and espresso machines – from the traditional pump espresso to fully automated bean to cup coffee machines. Not a bad machine if your after ‘cheap and cheerful’ and don’t wish to steam milk. I have several bean to cup machines (home and work) and have a very similar model. Krupps are fairy poor when it comes to reliability. Most people, including myself, find that the seals leak at about the 2 year mark. That said, at £250, this makes the machine effectively disposable as soon as anything breaks. Mixed Reviews on Amazon. Think i'd wait for a De,Longhi deal. Takes up more kichen space than an upmarket instant coffee and far more …Takes up more kichen space than an upmarket instant coffee and far more expensive!! !